TheLongside.co.uk - Burnley - Charity Shield 1973 remember? Burnley - Charity Shield 1973 remember? Burnley v Man City 1973.FA Charity Shield. I went to this game at Maine Road ( not Wembley as is the norm) but can anyone explain why City played Burnley for it. It was always the League champions playing the FA Cup winners from the previous season. But City or Burnley didnt win either! !, they didnt even reach the final. Its puzzled me for years!! 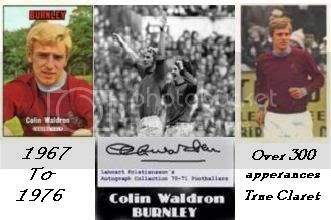 Re: Burnley - Charity Shield 1973 remember? Not sure , We finished the season before 1st in the 2nd div ..
Man city (i think ) finished 2nd in the 1st . but ill find out for you , by tomorrow. man city were the holders of the charity shield. burnley,2nd division champs,were invited to play the holders,man city. Edited 1 time(s). Last edit at 27/01/2008 21:46 by fulledgelad. I think after Arsenal did the double in 1971 and didn't want to play in it, it was the D2 champions and the Cup runners up who were invited and the precedent was set then. We were invited to play as D2 champions and City were the holders but I've no idea how City came to be in it the season before. I did used to know the reason why so the answer's out there somewhere. I was at the game and the Waldron goal that won it came from one of the best worked free-kicks you'll ever see. It absolutely ripped the City defence apart and I'm sure it would be succesful if it was tried again now, at least for a couple of games before the TV pundits got hold of it and analysed it. Then it probably wouldn't work for another 30 years. Edited 1 time(s). Last edit at 28/01/2008 10:41 by bordeauxclaret. Bedfords I was there but I'm not too sure about why it was Man City and us, it was a month or so before I got married and I thought it had something to do with the fuel crisis and not encouraging travel by supporters, but I may be wrong. I have also got the programme, but I cant get into my chest to have a look for it because I broke my arm two weeks ago. Edited 1 time(s). Last edit at 28/01/2008 10:43 by colinwaldron. Thanks CW, I hope your arm gets better soon. I broke my arm two weeks ago. OWCH How did you do that CW? Nowt to do with the `landscaping` business was it? Presume it will curtail your part time taxi job too. Hope you're ok & it's mending well. It was sore the next day and went to the Walk in place were they xrayed it, told me I had broken it and booked me an appointment the next morning at the fracture clinic, just below the elbow on the lower left arm, they havent plastered it, its in a cuff/sling and Ive got to go back a week on Thursday. So did the missus sleep through it? I've heard that Whisky helps to numb pain. I don't believe that story at all. I'm sure it was caused by CW jumping up and down with excitement when a short priced favourite he'd backed actually won the race, and he fell over some furniture whilst celebrating. Nevertheless, I hope it's better soon mate. CW, with the horses I'm backing at the moment I'm in perfect health and likely to remain so. The 1973 Charity shield should have been played between Sunderland and Liverpool, but back then the competition was not perceived to be that glamorous so both teams decided to opt out, Man City had won the comp in 1972 so were invited to play again and Burnley being 2nd Division champs were also invited. Funnily enough I seem to remember the season after Leeds and Liverpool were originally asked but refused so Burnley as holders were invited to play again, then the FA stepped in and moved the venue to Wembley, so immediately Leeds and Liverpool then decided to play leaving us out in the cold. Brilliant, Thanks a lot for all the info...I can sleep at night now. Might be playing in it again sooner than we all think. Go on The Burnley! Thanks for that FC. It explains the 73 game and the 71 game was the D2 champions against the Cup runners-up but I'm still curious about the 1972 game. City beat Villa but why were those two teams in it ? City finished 4th in the League, Villa had just won the 3rd Division and neither had even got to the Cup semi-finals. It's not really important but any idea ? Not really sure BC, but maybe they were invited when others had turned down the invitations, as Sunderland and Liverpool had done, perhaps they just went down the leagues in finishing order till somebody accepted.